Having been obsessed with the folk horror genre ever since I was a child, I was quite excited to see that RS Pateman, author of The Second Life of Amy Archer, has written a novel about a girl and her mother moving to a Gloucestershire village full of insular, superstitious locals, unsettling rural traditions and grim local legends. On the other hand, my folk horror nerdery is so extreme that it's also quite hard to please me with this sort of story: get it wrong, and I will burn you to death in a giant wicker man. It's fortunate, then, that Pateman gets it very much right with The Prophecy of Bees. The eerie atmosphere builds with just the right momentum, and the plot, which centres around rumours of a curse placed upon a Tudor manor house now occupied by teenager Izzy and her American mother Lindy, is satisfying. It's fair to say you will find just about every genre trope here: Izzy is warned about the curse by a group of villagers in the local pub, which meant I could picture the landlord as perennial Hammer innkeeper Michael Ripper, and someone actually does say 'you mark my words' at one point'. Ghostly scratchings, hidden bones, midsummer rituals, standing stones, coded manuscripts, things in sevens, creepy twins, weird sacrifices and bizarre superstitions can all be found here. But this is absolutely not a bad thing. It is, in fact, exactly what you should want from a story like this and as such I enjoyed every page. This is a book that doesn't appear to pretend to be anything it's not, and it's all the better for it. I wasn't immensely surprised by the final revelation, but at the same time, there's enough ambiguity to leave the reader with plenty to think about at the story's conclusion. What, exactly, is real here? Are the villagers right to fear the curse apparently placed on Stagcote Manor, or is the curse the fear itself? Izzy's role as narrator means we spend a great deal of time in her company, and fortunately she is convincingly written and well constructed as a character. Having read many a novel in which a male author makes a terrible of job of writing young women, I was pleased to see that RS Pateman did an excellent job here. Moreover, it would have been easy for Izzy to be terribly annoying: the daughter of titled multi-millionaires, she is a teenage rebel who smokes roll-ups, resents her mother, wears too much black eyeliner and falls for boys who live in squats and play in bands. And yet somehow she still comes across as flawed and genuinely troubled rather than merely brattish and spoilt, which is no mean feat on the author's part. Her mother Lindy, too, is far less irritating than she might have been, even seen through Izzy's critical eyes. Misguided and overbearing she may be, but she does ultimately have what she believes to be Izzy's best interests at heart. The relationship between mother and daughter makes an interesting counterpoint to the main plot. 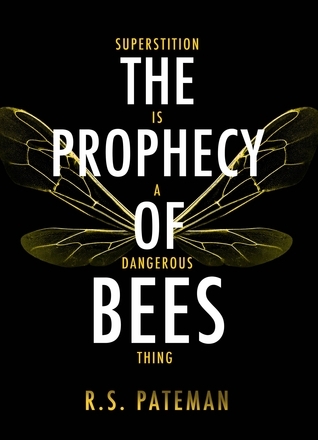 The Prophecy of Bees an excellent chiller that's part supernatural horror, part psychological thriller. It's appropriately paced, packed with memorable moments and remarkably sinister detail, and builds to a tense climax. Despite an obviously contemporary setting - mobile phones, social media, Latvian housekeepers - it also has something of the feel of the best British horror of the 1970s about it, which I mean in a way that's entirely complimentary.